For transgender youth and their families, learning to navigate this new phase in their lives can be a daunting task. It’s common to feel like you don’t understand, but taking on the learning process as a family can make all the difference. 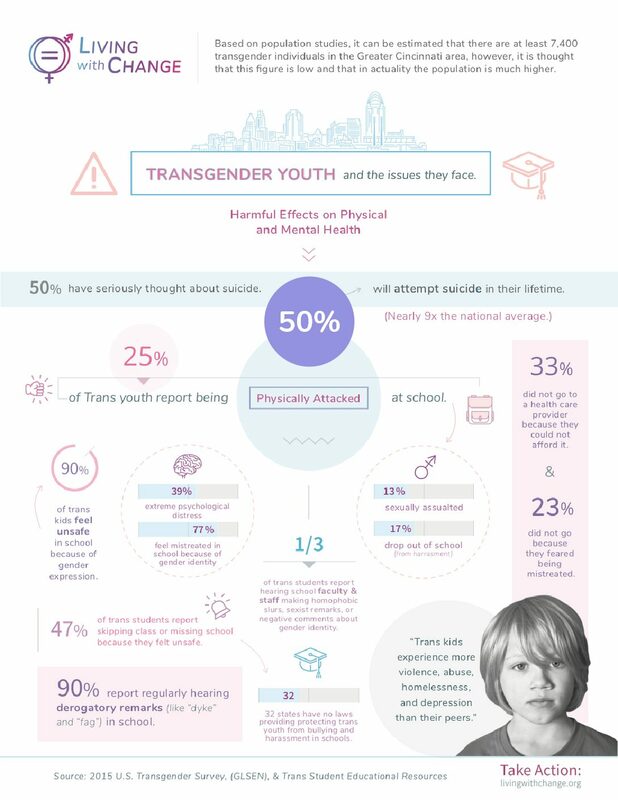 To help alleviate this burden we have our resources section and also offer community wide trainings that anyone may attend to learn more about what it means to be transgender at no cost. Sign up using the form below! In addition to our facilitations at schools and in the workplace we are also offering community-wide LGBTQ+ inclusion facilitations for others to attend at no cost! We will have rolling dates and offer both LGBTQ+ basics and Trans 101 for those that have already completed the basics. Both are opportunities to learn more about the trans community and what it means to be transgender. Sign-up below and receive more information! Like most cities, Cincinnati has struggled with LGBT inclusivity. In 1992, City Council passed an inclusive non-discrimination policy, barring discrimination on the basis of sexual orientation and gender identity. The next year, voters repealed that law and wrote discrimination in the City Charter. That law lived on the books for over a decade, responsible for population decline and at least $45 million in lost Convention business. But in 2004, voters repealed the law, becoming the only successful LGBT ballot initiative in the country that year, when 13 states (including the state of Ohio) banned gay marriage in their constitutions. Cincinnati is the right place. And now is the right time. Cincinnati’s anti-LGBT law is repealed by voters. Cincinnati City Council reinstates the Human Rights Ordinance, barring discrimination on the basis of sexual orientation and gender identity. Chris Seelbach is elected the first openly LGBT person in Cincinnati’s history. Cincinnati extends equal partner benefits to all City employees. Children’s Hospital Transgender Clinic opens. Cincinnati becomes first City in the Midwest, and third in nation, to offer transgender-inclusive healthcare. Cincinnati scores 100 on the Human Rights Campaign Municipal Equality Index for the first time, signaling our place as a national leader on LGBT equality. Cincinnati resident Leelah Alcorn takes her own life, sparking a world-wide conversation on what it means to be transgender and trans-equality. Cincinnati becomes the first city in the nation to ban conversion therapy for minors. A total of 327 patients are seen by Children’s Hospital Transgender Clinic. Cincinnati resident Jim Obergefell takes fight for marriage equality all the way to the United States Supreme Court, resulting in the historic Obergell v. Hodges decision, making marriage equality legal in every state. Children’s Hospital Transgender Clinic reaches 930 patients, almost 3 times the amount it started with just 4 years earlier. Living with Change is launched, aiming to ensure every transgender child has access to the medically necessary care they need to live in a world that is safe and inclusive. We use transgender as a shorthand that is all-inclusive and welcoming of the many genders and expressions that exist. Transgender includes identities like trans in addition to those who identify as gender fluid, bigendered, non-gendered, and genderqueer. Gender is a spectrum, and we respect and seek to build better communities for people who live at each and every point of that spectrum. If you—or your children—need someone to talk to, don’t wait. The Trevor Foundationand the TransLifeline are great resources, experienced in transgender youth issues, available 24/7 to talk.